A year ago today, I was at Camp Leatherneck, Afghanistan, grateful that I had made it through a hairy three-week embed in the former Taliban stronghold of Marjah unharmed. I haven’t been back to Afghanistan since, although another trip looks promising for the fall. I’ve continued to man this blog, though, and readers have continued to share their thoughts on the sacrifices that are necessary during long, hard deployments. Frequently on Friday, you’ll find a new installment here of Bored Marine Video, which highlights the lighter sides of being a Marine. On Memorial Day weekend, however, that seemed wildly inappropriate. 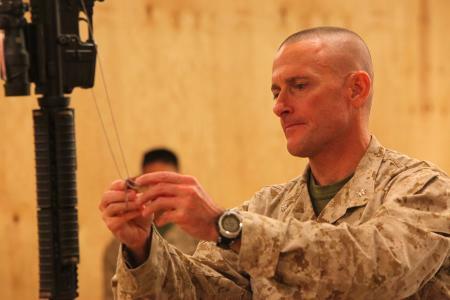 The most recent Marine casualties announced are Lt. Col. Benjamin Palmer and Sgt. Kevin Balduf, who were reportedly slain by a member of the Afghan National Civil Order Police in a random act of violence May 12. There are scores of others since last Memorial Day, however, including many who died in Sangin, Marjah and other parts of Helmand province. This post goes out to all the service members who made the ultimate sacrifice in the last year — and their families. Thank you. Let me echo that gratitude. Having my nephew, a proud Marine, in Sangin this Memorial Day makes this day even more poignant. God Bless all who serve and those who have served protecting my wonderful and beloved USA.